Ceveral lives have been lost and many have been injured due to accidents involving stray cattle in the past. With an increase in their numbers over the years they pose a serious safety threat if steps are not undertaken in the proper direction. Stray cattle roaming around freely in the jurisdiction of Canacona taluka is an year round phenomenon which has lead to some serious and fatal accidents in the past. Steps taken to handle this issue have not yielded any positive results as their number is found increasing year after year. Concerned citizens from Canacona taluka believe these animals are left to fend for themselves and are seen scavenging by the road side and at market places leading to a serious threat to motorist and the general public. The main cause leading to wandering of cows and bulls in the taluka is the owners of these stray animals have abandoned them as their upkeep is not economically viable feels ex chairperson of Canacona municipality Ajay Bhagat. In the past majority of the people from Canacona taluka used to do paddy farming and owning cattle was necessary to plough their fields. Today most of them have abandoned farming and a few who still grow paddy have bought mechanical tillers subsidized by the agriculture department. Today most of the cattle owners don't have a cattle shed and all the cattle from a particular area roam the streets and market places in groups causing inconvenience to every one around feels Mr. Bhagat. Mr. Diogo Da' Silva President of the Association of Businessmen of Canacona says the stray cattle spend the whole night masticating in front of shops and dirty the front portion of the shops with cow dung, plastic bags which they ingest thinking it is food. This pack is always accompanied by a alpha male bull and if any cow in the group is on heat this bull is uncontrollable which has lead to many accidents in the past Da' Silva added. "Many times fight breaks out in the market places for supremacy amongst bulls leading to damages and financial losses to the vehicles parked in the vicinity lamented Da' Silva. Mr. Manoj Prabhugaonkar a resident of Mashem speaking to Herald said that there are stretches on the road at Shellim, Mashem, Poinguinim, Bhatpal, Chaudi, Charasta and Gulem where stray cattle sit on the road obstructing free flow of traffic. "It is believed the cattle sit on the road as the surface of the road is warm and smooth devoid of any stones, the fast moving traffic drive away the insects pestering them” said Prabhu Gaonkar. 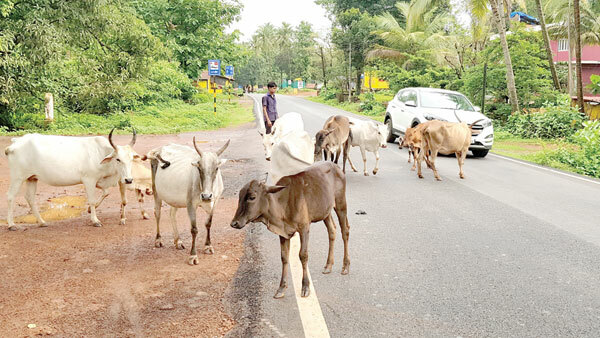 "We see dead cattle and buffaloes frequently on the NH66 road in Canacona, the cause of which is they get hit by heavy moving traffic during the dark hours as they are hard to spot in the night" said Prabhu Gaonkar. The problems of impounding these cattle are many. First, the paucity of trained men to catch and load them onto a truck and secondly, the lack of gaushalas with adequate space have compounded the situation. Earlier efforts at fitting radium tapes around the horns of this cattle did not yield long term results feel aggrieved locals here. The municipality and panchayat should take positive measures with the cattle owners by tagging them so owners can be fined if their cattle are found on the roads feels locals from the taluka. Since the cattle owners are financially not able to take care of their cattle by providing proper shed and grazing grounds a cattle owner suggested the government build community sheds at suitable areas in Canacona to help them maintain their cattle and solve the problem of stray cattle.